So if y'all remember back a few weeks, I blogged about Summer Book Crush. A sweet opportunity to buy some e-books at bargain prices. Remember? My point-of-contact for the event was Angela Orlowski Peart, one of the authors. After a few emails back and forth, I realized that she had written some pretty sweet fantasy fiction, and she realized that I love to blog about books, especially of the e-read variety. Clearly a magical partnership was necessary. Angela emailed me her books, formatted for my kindle, in exchange for my honest review. Luckily for her, I LOVED her books, so I don't have to write any diplomatic BS about her work being better-suited for people who aren't me. The Forged Series is a blend of urban fantasy and high fantasy, Forged by Greed being the former and Forged by Magic: Origins being the latter. 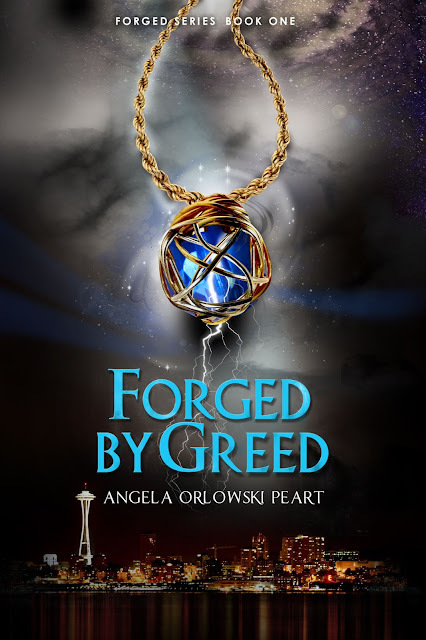 Forged by Greed is a full-length novel, and Forged by Magic: Origins is a collection of short stories that serve as a prequel. Read them in the published order, even though they're both available. Nerdy #ProTip: Prequels work best when read after reading the main novel (think The Chronicles of Narnia). I somehow managed to read this in a single weekend, one that was largely spent working at JCP. Almost immediately, I was intrigued by this overlapping mortal/magical world, one with two races of shapeshifters, two goddesses, an amulet, and otherworldly realms. At first, I struggled to keep straight all of the characters and their respective races/friend groups, but as the book progressed, I understood the need to have so many characters. There's definitely a lot to digest in the first few chapters, but if you stop trying to analyze it (difficult, I know! ), and just keep reading, everything comes together. I know that the genre of "star-crossed lovers" has been done, many times over, but I never grow tired of it. Plus Angela definitely included a few twists to keep things interesting. The true reason Jatred and Jasmira can't be together is MIND-BLOWING, to say the least. The more I learned about the Winter and Summer races, the more I wanted to know. Angela has borrowed from ancient mythologies worldwide to create a a new mythology of two races, led by two goddesses. So obviously, I was excited to finish this book and then start the prequel, which fills in many of the gaps about this mythology. 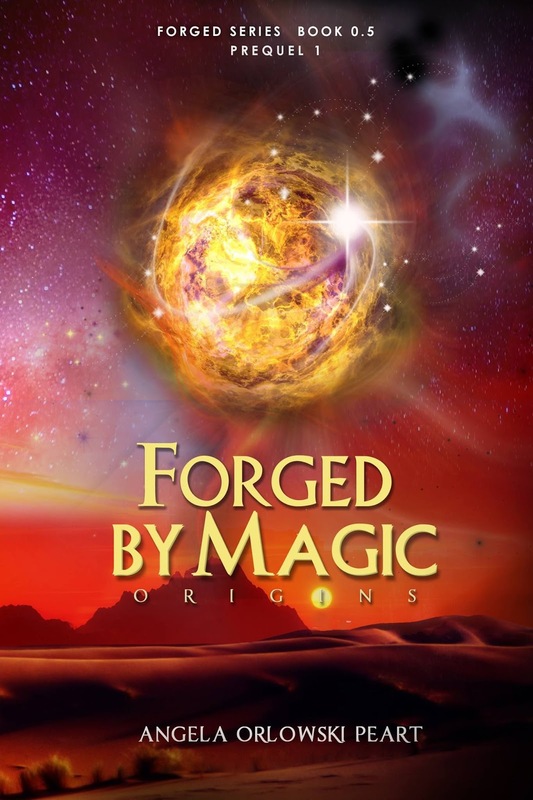 Prequel 1 to the Forged Series, Forged by Magic: Origins is a collection of short stories, featuring the characters from the Forged series. This is the first of two prequels to the series. Each story is told from a different character’s point-of-view. Like I said, the mythology Angela has created is fascinating. I loved reading more about the magicians, the Amulet and the Dasht-e Kavir, the goddesses, and the shapeshifters in their early days. I was a little confused by the inclusion of a story about a water nymph, but I assume this character becomes important later. The next prequel just came out on July 10th! I haven't had a chance to read Forged by Legacy: Beginnings yet, but rest assured, I will review it as soon as I can! Belle, I am SOOOO happy that you truly enjoyed the two books in the series. I value a honest opinion and so I'm thrilled to read your post! Thank you for letting your followers know about the Forged series. I honestly did! I even bought your next prequel. I just haven't had a chance to read it yet. I need to finish The Outlaws of Sherwood by Robin McKinley first.